Sign up for free and just shop with Disneyland® Paris as normal. Our average member earns over £300 cashback a year. Disneyland® Paris cashback can be earned simply by clicking through to the merchant and shopping as normal. Disneyland® Paris Cashback is available through TopCashback on genuine, tracked transactions completed immediately and wholly online. Spend some time in a magical kingdom with family or a group of friends and save money when booking tickets or packages thanks to our Disneyland Paris cashback deals. Whether you are planning on visiting Disneyland Paris, which celebrated its 25th anniversary in 2017, at Christmas or in the summer holidays, you will discover two parks crammed with amazing attractions, restaurants and shops which will dazzle guests of any age. Click through to the website and you will find all the information you could possibly need if you are thinking of paying a visit, while you can also sign up for exclusive benefits, news and offers. Visitors will enjoy shows and parades at Disneyland Park, while Walt Disney Studios Park will take you behind the scenes of classic movies. Get your thrills on exciting rides or meet your favourite Disney characters, while there are 16 hotels to choose from if you are planning a longer stay. Browse superb ticket offers or find out the various options you have when it comes to getting to Disneyland Paris, while if you download the free app, you will easily be able to navigate your way around the parks when you are there. If you are looking to book a trip, ensure you make savings by joining TopCashback on this page. There are two theme parks at Disneyland Paris, formerly known as Euro Disney, which are magical destinations for kids and adults alike. At Disneyland Park, you can explore five incredible lands packed with classic attractions, shows and street parades. You will be able to do a bit of swashbuckling with pirates, explore space or look on in awe at the light displays over Sleeping Beauty Castle. Enjoy the thrills of Buzz Lightyear Laser Blast or Indiana Jones and the Temple of Peril, while if family entertainment is more your thing, you can meet Mickey Mouse or watch the Starlit Princess Waltz. There are plenty of dining options too, whether you fancy some French, Italian, American or British cuisine. The other park is Walt Disney Studios, which allows you to go behind the scenes of the world of film and television. Watch classic moments at Toon Studio or be dazzled by the mind-boggling effects of the Backlot. There are five production zones to explore, each offering real thrills. Take on the Toy Soldiers Parachute Drop or explore the Art of Disney Animation, while you can also see Stitch Live. You will never have to worry about being stuck for things to do at Disneyland Paris, which is a great holiday destination for the whole family. Whether you love big thrills, are looking for fun for little ones or want to meet Disney characters, there are a whole host of rides, tours and attractions to enjoy. Take a look on the website and you will be able to find something for children, teenagers and adults alike, including Big Thunder Mountain, Pirates of the Caribbean, the Princess Pavilion and the Studio Tram Tour. The parks also host seasonal and special events throughout the year, including Disney's Enchanted Christmas, the Music Party at Billy Bob's and Disney's Fairy Tale Weddings. You can also plan your trip to coincide with fireworks displays and parades, or book your place for exclusive character dining events. If you are planning on staying near the parks for a few nights, you will have 16 Disney hotels and partner properties to choose from which are ideal for city breaks or longer stays. Whether you are looking for five-star luxury or budget hotels, you are sure to find a hotel to suit your needs. Some options are within a five to 20-minute walk of the park, while others are either 10 minutes away via free shuttle or a 15-minute drive by car. Opt for a stay in an apartment hotel or cabin, while you can also make bookings for hotels offering family rooms, suites and rooms which provide disabled access, while you can search for properties with facilities such as swimming pools, a gym or spa, free shuttle or character dining. Options available for prospective guests thinking of booking Disneyland Paris holidays include the Disneyland Hotel, Disney's Newport Bay Club, Disney's Sequoia Lodge and Disney's Hotel New York, while some of the partner hotels include the Vienna House Magic Circus and the Vienna House Dream Castle Hotel. 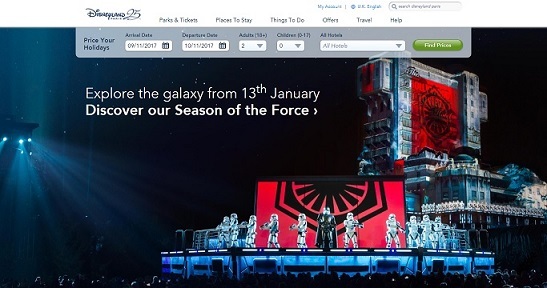 If you are planning a trip to Disneyland Paris for a few nights, or think you will be visiting more than once within a year, you will find great ticket offers on their website. Multi-day tickets are perfect for discovering the theme parks as they will give you more time to explore Disneyland Park / Walt Disney Studios Park attractions. Tickets for both adults and children are available for two, three or four days. Alternatively, annual passports will allow you to visit the resort whenever you like for a whole year. There are four levels of ticket available - Discovery, Magic Flex, Magic Plus and Infinity - which provide access to the two Disney parks for 150, 300, 350 and 365 days per year respectively. Other benefits include everything from discounts at Disneyland Paris shops, restaurants and park entrance to invitations to special events, use of the privileged car park and free access to swimming pools at some Disney hotels. Whether you are planning on visiting as part of your Paris holiday or will be travelling from another part of France, Disneyland Paris is easy to get to from both other areas of the country and the UK due to the fact that the park gates are only 20 miles from Paris, it takes around an hour from the city's airports by shuttle bus or a two-minute walk from Marne-la-Vallee/Chessy train station. What's more, you can choose your hotel package and add a transport option on the Disneyland Paris website. Fly from key UK airports to Disneyland Paris with Flybe or Air France, while British Airways and easyJet also fly to Paris. Disney Holidays which include flights will be ATOL protected, while your package will include accommodation and Disneyland Paris tickets. Once you arrive at one of the Paris airports, you can take the Magical Shuttle airport bus to your Disney hotel. You can also travel by train, by taking the Eurostar from London St Pancras International, Ebbsfleet International or Ashford International to within a two-minute walk of the parks. Alternatively, you can hop on the Eurotunnel Le Shuttle from Folkestone to Calais or take one of P&O Ferries' ships from Dover to Calais and then drive to the park. If you are travelling to or staying in the French capital, daily Disneyland Paris Express shuttles run from three convenient locations. If you are planning a holiday to Disneyland Paris, you will be able to enhance your visit by downloading the official app for free. It will provide you with many great benefits, which you can take advantage of before you go or while you are there. You will be able to view the waiting times for attractions at both Disneyland Park and Walt Disney Studios Park, while you can get to what you are looking for quickly as it features GPS-enabled maps which show your location in relation to attractions, restaurants and shops. You will also be able to buy theme park tickets from your device and view daily schedules for parades and entertainment, as well as opening hours or accessibility and attraction information. You can browse the app in a number of languages, including English, French, German and Spanish. Share magical family moments at the place that is so much more than a theme park. Disneyland Paris is the number one tourist destination in Europe and incorporates two theme parks, seven themed hotels and a range of dining and entertainment options. The resort also features the Disney Village entertainment and shopping complex, as well as a host of shows and parades. Book park tickets and park and hotel packages online and earn great cashback rewards with these deals.